Exported to America by early settlers and explorers, the Spanish Goat was historically used as a source of meat although it gained more popularity for its brush control ability in more recent history. While not the most challenging animal to hunt, the Spanish Goat creates a nice mount and makes a nice addition to any trophy hunters collection. 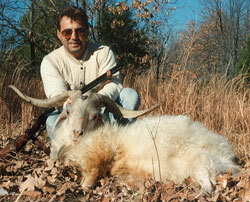 For more information or to book your Spanish Goat Hunt, please call (314) 209-9800 or fill out our contact form.